PMP and CAPM Exam Prep Simplified! An Earned Value Tutorial - Earn 2 PDUs too! This effort by article by Mark Durrenberger, while accurate enough, is overly simplistic and reflects a typically PMI centric view of earned value. For instance, while mark recognizes the challenge of measuring the % complete of intangible tasks, he does not suggest how to accurately measure them. Contrast this with AACE, who offer 6 common methods. IMPO, AACE, in their Skills and Knowledge of Cost Engineering, 5th Edition http://tinyurl.com/ylbh8bc contains a MUCH more complete and robust treatment of Earned Value. 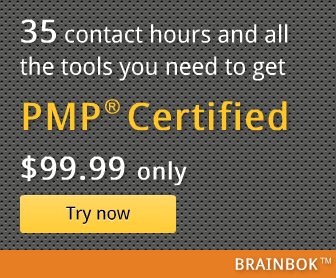 Is PMP Just a Job-Hunting Tool? Help Project Managers achieve and maintain their PMP® Certification through self-study in the most effective, efficient, ethical and economical manner. © 2017 PMP | CAPM | Certification Tips | Exam Prep | PDUs | Study Material by Deep Fried Brain ProjectPMI, PMP, CAPM, PMI-ACP and PMBOK Guide are trademarks of Project Management Institute Inc.